The weather here has been so unpredictable that the temperature seems to swing from one extreme to the other like a pendulum. It could be so hot that anything more than a light floaty dress or a pair of shorts seem almost unmanageable. Conversely, it could be raining every single day which is EXACTLY what has been happening for the past week. Thankfully, my new Gloverall duffle coat arrived just in time because I haven't stopped wearing it for the last 2 days. I was rather surprised to get several inquiries from friends wanting to know where they can purchase it. It seems that there are others just like me who prefer to look fairly decent in the rain rather than schlepping around town in ugly raincoats. Outfit: Gloverall Wax cotton duffle coat, Petit Bateau striped top, Hermes belt, Uniqlo jeans, Hermes Thalassa Birkin 30, Repetto ballet flats. 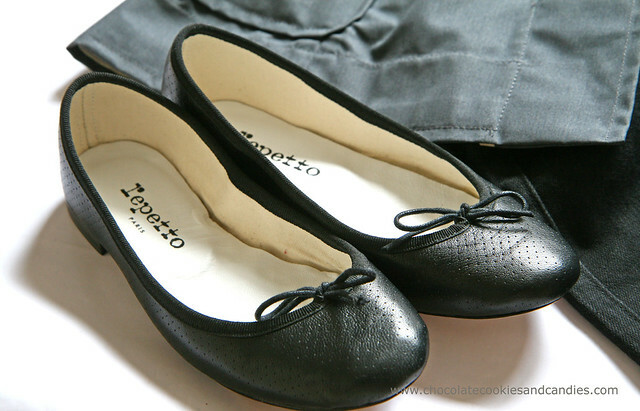 These black Repetto ballet flats just arrived in the post today. I was thrilled that I only had to pay £56 instead of £165. I try to avoid paying full retail price unless I absolutely have to. I've recently noticed that Repetto sizing can be a little inconsistent. In the past, I'd only ever bought size 35s but I found the patent ones a little snug and stiff. I bought a pair from Repetto's flagship store on Rue de la paix last year and these have a little more toe cleavage than the ones I'd purchased. They turned out to be way too tight. Mistake number 2: do not buy shoes earlier in the day because by late afternoon, your feet would've swelled. These are size 36 which are a little big but after making a few adjustments with the leather laces, they seem to fit much better. Since it feels like autumn EVERY SINGLE DAY, I'm glad that there's an abundance of summer produce. These green olives are the best I'd ever eaten. They're from the farmer's market and are so different from the usual soggy and salty crap that comes from a can. They're crunchy, luscious and oh so delicious after being marinated in basil, garlic and lemon. 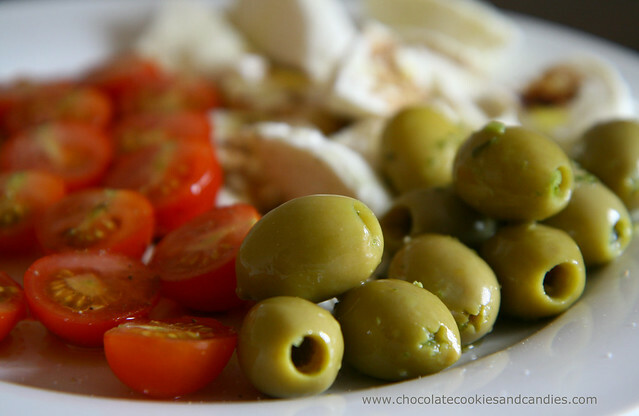 I love the sweet tartiness of the vine ripened cherry tomatoes with fresh mozzarella, drizzled with extra virgin olive oil and a touch of balsamic vinegar. I need a decent raincoat as well... BTW, I hope you're not taking the birkin out in the rain! It's been rainy the past few weeks here too, but it's still so hot and muggy that I can't even think about trying to put a trench or raincoat on... I'm just toughing it out with my umbrella! Did you order the repettos online? If yes could you possibly give a link? I still need replacements for my ballerinas and these are really cute, especially since they are not plain black, but have these little punch holes. Thanks! Ooh! I've nver heard of this brand but I love it! Is it similar material to the Barbour oil repellant cotton stuff? Chin, Coggles.com ship internationally but they've sold out. I think they have one last coat in XS for only £68. Oh yes, I use all the H bags rain or shine. Mary Lane, I guess I shouldn't say I envy you. I can't handle high humidity really well. Sog19b, I bought these on eBay. I've purchased many pairs of Repetto at ridiculously low prices. These perforated ones have super soft lambskin leather. The only thing about buying from eBay is you'll have to wait and search often. He bought me a Gloverall winter coat and I've been hooked since. It's exactly like the oil waxed cotton material like Barbour and completely waterproof. love, love, love your coat and am sooooo bummed that it's sold out!!! Heard from friends in Lux that the weather's been depressing, and thought I could cheer myself up with a new buy waiting for me when I get back... Shucks! I love how you pair your coat with the hermes. You are such a fashionable mom. And those olives look so thick and juicy, can you send some over to me? I'm hungry now = hehe. Thanks for the post. Heather, a friend of mine got on Coggles last night only to find that they've all sold out. Hopefully, you can google and see if there other online stores may still have some in stock. Yup, the weather is pretty crap at the moment! MMC, thank you! So kind of you to say so. LOL, I would love to send some to you but I think the Canadian customs may seize them first. What with all the olive oil dripping all over the envelope. They are really delicious. Mine were a sample sale fluke, too - in true Chocolate, Cookies and Candies fashion. I grabbed the shoe on the rack.... on sale for $60...but the Nordstrom SA could not find the mate! He took my name and number and called maybe 2-3 weeks LATER saying he'd finally found it in the stockroom! Wow! I've yet to purchase a pair of Repetto for THAT cheap! I crown you the Bargain Queen. Kudos to your wonderful SA who went the extra mile for a pair of discounted shoes. I saw a pair of beautiful Repetto heels for £40 down from £275 but alas they were 2 sizes too big :( BUT they would've fitted you perfectly. Great flats! Just a question: popping next week near an Uniqlo shop (there is none where I live). I've seen many times in your blog those Uniqlo pants. Do you recommend them? I was thinking more in the lines of a Capri ones... but I mean about quality an all. Hi Arte, a friend of my hubby's who owns a textile company had an opportunity to visit Uniqlo's denim factory and he said the quality is exceptional. I agree. I've always worn James Jeans or Seven For All Mankind and compared to Uniqlo, there isn't a huge difference other than the cut. Mine's a skinny straight and I fold the hem up to make them look like a Capri. Hope this helps. Great outfit! The anorak rocks! I tried Repetto when I was in London and I was disappointing, although they are soft, they are also very thin and I doubt they would last more than a week with my kind of walking. Any recommendations on sturdy flats, but not too sporty looking? Lily, you'll be surprised. I walked everywhere in these - Paris, Hong Kong, London etc. My current ones are almost 5 years old. I resole them every year which is why they last so long. My only advice is not to buy the patent ones as they tend to split. The lambskin exterior is far more durable. Do you like Tod's? I prefer their mocs with leather soles. I had mine for almost a decade before my mom took them. They look like new despite being worn to death. For some reason, I can't wear ballet flats with elastic band so Lanvin and Bloch flats are out of the question for me.